Fright-Rags has all the House Of 1000 Corpses merch you need! While Rob Zombie is hard at work on Three From Hell, Fright-Rags is going back to the film that started it all: House of 1000 Corpses. An exclusive collection of merchandise is available in conjunction with the film's 15th anniversary. The House of 1000 Corpses line kicks off with a Captain Spaulding 6" mini-mask. It's Fright-Rags' second mini-mask and is a callback to the Ben Cooper/Collegeville Halloween masks and costume sets from our childhood. However, at half the size of a traditional mask set - and the same height and width as a Blu-ray box - these unique collectibles fit easily on any shelf. Fright-Rags expands its series of trading cards with Houses of 1000 Corpses wax packs. Available in single packs, factory boxes, and sealed boxes, the line includes movie photo cards, stickers, special foil cards, and chase cards, and original artist sketch cards. 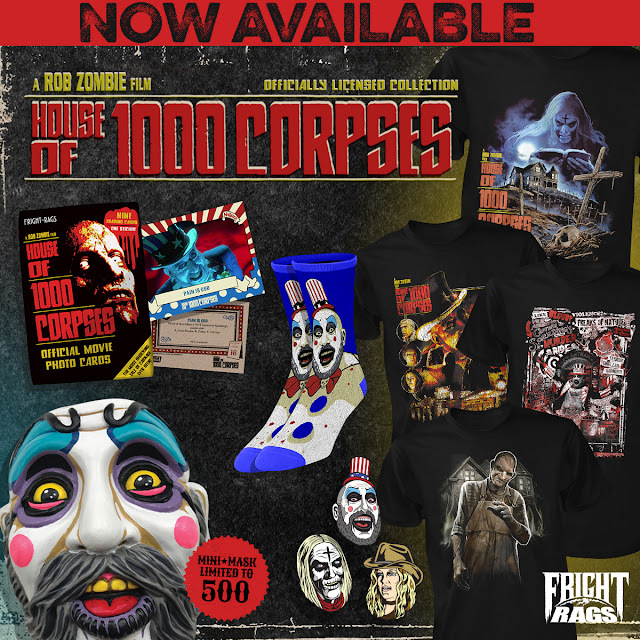 The line also includes four House of 1000 Corpses T-shirts; Captain Spaulding crew socks; and enamel pins of Captain Spaulding, Otis, and Baby. You like blood? Violence? Freaks of nature? Well, then head over to Fright-Rags.com for the House of 1000 Corpses collection.